Exposure: Exposure: 14 x 9 min (1x1 bin) exposure with UV/IR block, 12 x 8 minutes (2x2 bin) exposure with Hydrogen Alpha filter, 8 x 4 min (2x2 bin) RGB exposures. Processing: Data Collection - Sequence Generator Pro (as FITs). Calibrated, stacked (Kappa Sigma Combine) - Deep Sky Stacker. LRGB channel registration, equalization, and gradient removal - Astroart. Curves, Levels, RGB combine - ImagesPlus. Luminance Layering, final stretch, and finishing - Photoshop. RGB calibration - eXcalibrator. This image is a RGB combine with Luminance layering. Color saturation in LAB color. The H-Alpha filter exposure was screen blended into the IR/UV Blocking filter exposure stack and used for the luminance layer. Ha was screen blended into the Red channel - emission balance of RGB done with Channel Mixer in Photoshop. Images processed at 3352 x 2532 resolution. Final Image size is approximately 2600 x 1950. North is up in this image. 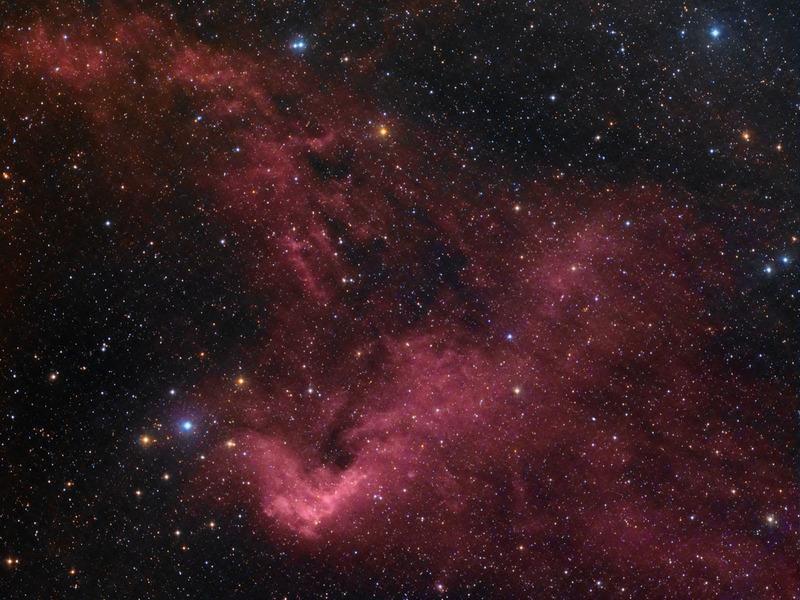 This field contains emission nebulosity in the constellation of Ophichus. The bright portion of emission nebulosity is LBN 35. Two other (but dimmer) Lynds Bright Nebulae are also in this field - LBN 32 and LBN 39. The dark nebula intermixed with LBN 35 is known asLDN 238. This dark nebula is also a molecular cloud with the designation of MBM 139. These objects and some of the brighter stars are identified in the annotated image. Horizontal FOV is approximately 120 arc minutes. Image center is approximately - Equatorial 2000: RA: 16h 34m 57s Dec: -08°30'30"